When Delilah Hoefner (or Hoefener) was born in 1911, in Wisner, Nebraska, her father, William, was 59 and her mother, Marie, was 43. 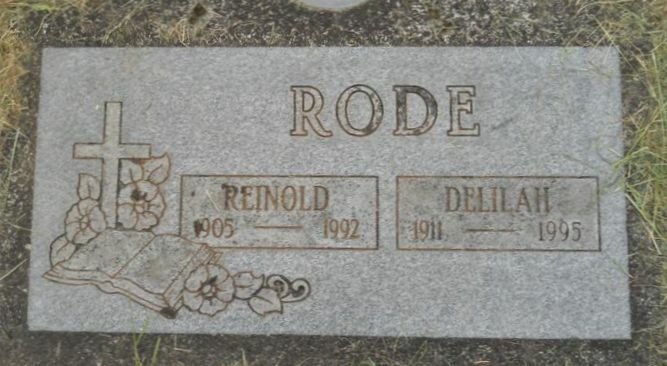 She married Reinold Rode in 1930. She had four children by the time she was 25. She died about 1995, in Tacoma, Washington, at the age of 83, and was buried there. Delilah Hoefner was born on 2 September 1911[i], the youngest of ten children in Wisner, Cuming county, Nebraska. Her siblings included Emil, Ella, Albert, Edmond, Hattie, Arthur, Wilburt, Martin, and Paul – seven brothers and two sisters. The 1930s began with the couple living near Allen, Pierce county, Nebraska. [vi] The couple also had four children, two girls and two boys. In 1935, the couple were still living in Cuming county, Nebraska but moved to Willow, Antelope county, Nebraska before the 1940 Census in April. Anyone who has additional information, photos, or comments, please reply via the comments below. [i] “U.S., Social Security Death Index, 1935-2014,” Delilah Rode, Social Security Administration. Social Security Death Index, Master File., Number: 475-40-6730; Issue State: Minnesota; Issue Date: 195, Ancestry.Com. [ii] “1920 Census,” West Point, Cuming, Nebraska, Roll: T625_984; Page: 13A; Enumeration District: 76; Image: 1106, William Hoefner – Head, Fourteenth Census of the United States, 1920. (NARA microfilm publication T625, 2076 rolls). Records of the Bureau of the Census, Record Group 29. National Archives, Washington, D.C., Ancestry.Com, 31 Dec 2015. [v] “1930 Census,” Allen, Pierce, Nebraska, Roll: 1290; Page: 5A; Enumeration District: 0001; Image: 11.0; FHL microfilm: 2341025, Reinold Rode, United States of America, Bureau of the Census. Fifteenth Census of the United States, 1930. Washington, D.C, Ancestry.com, 1 Jan 2016. [vi] “1930 Census,” Allen, Pierce, Nebraska, Roll: 1290; Page: 5A; Enumeration District: 0001; Image: 11.0; FHL microfilm: 2341025, Reinold Rode, United States of America, Bureau of the Census. Fifteenth Census of the United States, 1930. Washington, D.C, Ancestry.com, 1 Jan 2016. [vii] Tacoma News Tribune / Morning News Tribune, “Tacoma Area Obituaries Database,” http://search.tacomapubliclibrary.org/obits/, 31 Dec 2015, Tacoma Public Library. [viii] Find a Grave, “Memorial# 39026556,” Delilah Rode, http://www.findagrave.com/cgi-bin/fg.cgi?page=gr&GRid=39026556, 31 Dec 2015.